There aren't a huge number of enhancements in iOS 4.3, but what is there is pretty darn powerful. Next to Personal Hotspot, the other headline feature is the arrival of Home Sharing in iOS. This enables you to listen to media on your iOS 4.3-enabled iPhone, iPad or iPod touch streamed from iTunes on your networked Mac or PC. And that's not only music – you can stream video, podcasts and audiobooks – indeed, anything that's in your iTunes library. You don't necessarily need the very latest version of iTunes to download the iOS 4.3 software update, but you definitely need the latest version of iTunes. Trust us, it didn't work without it. Make sure you download and install the latest version of iOS. This isn't a small download at over 600MB, so be prepared for it to take a little while. In case you don't know, iOS 4.3 is compatible with the iPad, iPhone 4 and 3GS (not 3G) and third generation iPod touch or later. Home Sharing is in the Advanced menu of iTunes. Select Turn on Home Sharing from the menu, at which point the main screen will ask you to sign in using your Apple ID or create one in the unlikely event that you don't have one already. Finally, click Create Home Share. You can also get to this under the Sharing heading in the left sidebar. As you might have expected, Home Sharing doesn't immediately pop up in the iPod app on your iPhone or iPad. Go to Settings > iPod > Advanced. 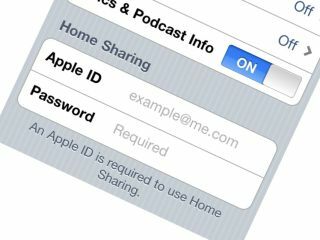 Under Home Sharing, add your Apple ID username and password. 4. Are you on the same network? Now, make sure your iOS device is on the same Wi-Fi network as the PC or Mac you want to share from. Otherwise you won't be able to play anything. Providing all has worked out, you'll be able to go into your iPod app (or the different media apps on your iPod touch) and play media. Click more. You'll see there's now an additional heading called Shared. You can now flip between the library stored on your device or browse the other shared libraries on your network including those on network devices.